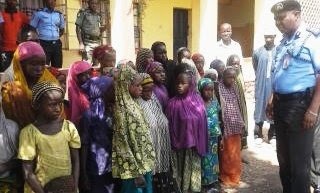 The police in Ogun on Monday said it arrested three suspected human traffickers with 26 children. The commissioner of police in the state, Abdulmajid Ali, made this known to journalists in Abeokuta. Mr. Ali said the suspects, identified as Zainab Ahmed (18), Aisha Abdulahi (55) and Zuliat Abdulmalik (45), were arrested on Sunday at a motor park at Ibafo in Obafemi Owode Local Government Area of the state. He said the arrest followed a tip-off from some residents of Ibafo while the suspects were trying to transport the victims to Lagos. “Our attention was called by some people living around the motor park on Sunday that some underage persons were seen at the park.“Our men left immediately and rounded them upThe children look innocent and we cannot leave anything to chance. .“We need to investigate very well to avoid unpleasant situation, particularly now that we have been alerted of threats of insurgency.“We need to carry out due diligence to ensure that they are not intended to be used as suicide bombers”, he said. According to the commissioner, the victims comprised 25 girls and one boy whose ages range between eight and 10.Mr. Ali said the suspects claimed they were taking the children to Lagos for menial jobs. He, however, said that investigations had commenced into the matter and that the suspects would be arraigned soon.